Spine Treatment & Surgery from best hospital India. Baby Girl was all of 18 months when she was admitted to the SafeMedTrip affiliated hospital in April this year with a head which had ballooned to an unprecedented 94 cm. After treatment, she left the hospital Thursday a healthy child minus the abnormality. The child was suffering from a rare condition called Hydrocephalus, which causes abnormal build-up of cerebrospinal fluid (CSF) within the cavities surrounding the brain leading to expansion of the brain. the baby girl had been through a series of carefully planned corrective procedures and surgeries that resulted in her substantial improvement. The first procedure was done on May 15. The surgeries included inserting a shunt to drain the fluid that had swelled her skull. She also underwent four cranial remodelling procedures, the latest on July 11 to progressively correct her skull bone structure by using pressure bandages. “Given the multiple complexities of the case, her prognosis has been very good. 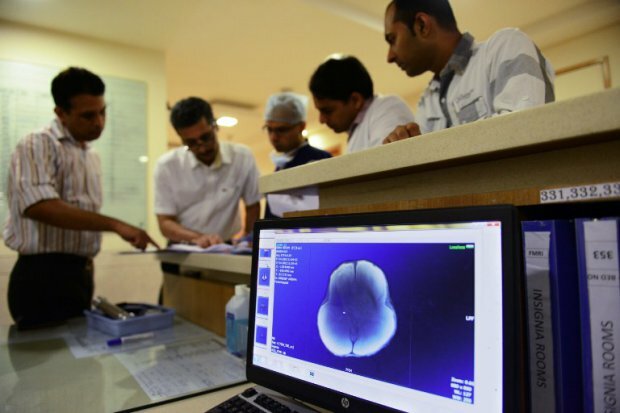 When the case first came to us, her survival was under question as such a case had never been attempted before anywhere in the world,” said Director of neurosurgery. After the surgeries, she is playful and responding well to her surroundings. Her weight, nutritional status and vitals are much improved and her head circumference is now a manageable 58 cm. “She is fit to travel back to her ” he said. Baby girl will have to come back for a review after a few months when she may need further corrections.